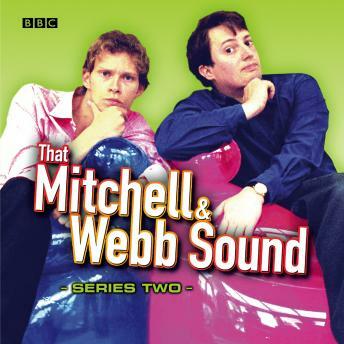 Starring David Mitchell and Robert Webb, from Channel 4's Peep Show, That Mitchell and Webb Sound is a hilarious mix of satirical sketches and surreal characters that provides a fantastically skewed perspective on everyday life. Meet soporific late-night DJ Adrian Locket; Peter and Ted, commentators who reveal the murky underside of the snooker world; crime fighter Angel Summoner and his redundant sidekick BMX Bandit; and the obnoxious, incredibly posh person who is still unaccountably a waiter. In addition, there's 'Numberwang! ', the maths quiz that makes very little sense, plus thrilling coverage of people you don't know buying houses and living in them, and thinking where to go on their holiday and then booking it. Zany and original, this consistently funny and imaginative series highlights the absurdity of reality TV, politics, chat shows - and milk helplines. 'By far the funniest sketch show in ages... fresh and full of invention... the world is an altogether better place when perceived through That Mitchell and Webb Sound experience' - Daily Telegraph.